A new, immersive and interactive technology is emerging that can change the way PR professionals pitch reporters and increase the opportunities to persuade them to take our point of view. It’s called Virtual Reality (VR), and if you’re not familiar with VR, you soon will be, according to Hollywood mega-producer, VR industry leader and Baobab VR Animation Studios co-founder Eric Darnell. Darnell mesmerized SFPRRT members at our March 28 luncheon with his storytelling skills and enthusiasm for VR’s potential across a wide spectrum of industries from entertainment to education and medicine. In VR, audiences wear a VR headset and immerse themselves in a 360-degree film experience, filled with sights and sounds at every turn of their heads, eyes and limbs. In “interactive” VR films, audiences engage with the characters and can influence a story’s outcome. Darnell showed SFPRRT members a film clip from Asteroids!, a Sundance Film Festival selection that he produced, featuring two aliens facing life and death choices, in which audiences get to participate. According to Darnell, giving people choices to affect outcomes turns the empathy they feel into action, leading to personal acts of compassion…or not. About 10 percent of the test audiences chose to do nothing to help the struggling aliens. As Darnell explained, there are endless opportunities to use this technology to tell stories, elicit powerful emotions and equally powerful responses. 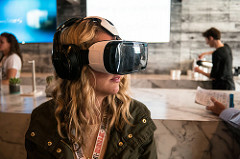 The United Nations used VR to tell one Syrian refugee girl’s story in the context of the refugee crisis in the film “Clouds Over Sidra.” The UN premiered the VR film at the 2015 World Economic Forum in Davos, Switzerland and subsequently rolled it out to donors in a humanitarian appeal, raising $3.8 billion. According to the research firm Greenlight Insights, which publishes an annual VR industry report, mobile VR headsets are expected to grow to 122 million by 2025, while tethered VR headsets are forecast to increase to 13.6 million by 2025. Savvy PR practitioners will anticipate this technology trend and prepare to take advantage of this realistic and emotional storytelling platform as VR becomes more dominant in the coming decade.